Download it in MP3 format. Live interview with Claudio during the Observer program, on Thursday 3rd october. 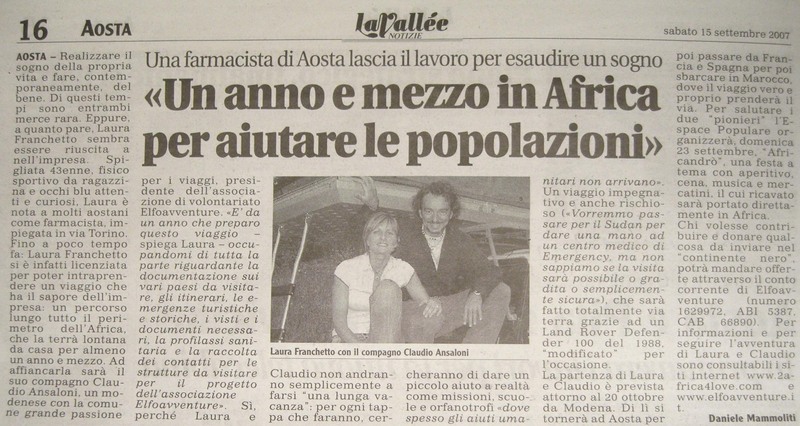 "Lo scarpone", a magazine for CAI members, publishes "To Africa for Love" article on pag. 17. Footage and interviews from the successful party "AfricaAndrò" in Aosta. "Un anno e mezzo in Africa per aiutare le popolazioni"
This article can be found on "La Valleè" issue on sale from 15th September (page 16). Download it in jpg format. "Claudio Ansaloni's adventure. The 18-month trip across Africa...for a good cause". This article was published on Sunday 9th September 2007,pag. 11. This is the title of the article published in the monthly magazine "Correre" September 2007 Issue, pag. 16 on our expedition. Maurizio Di Maggio interviews Claudio during the programme “Buena Noches”. The interview was broadcasted live by the radio station during the night programme on 16th July 2007. 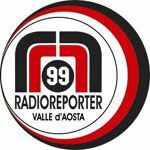 TIR is a radio station covering the regions of Piemonte and Valle d’Aosta. Live interviews during the morning programme “Mattina Tir” with Monica Migliaccio. 6:58 a.m.– 10:37 a.m.– 2:15 p.m.– 5:58 p.m. Article dedicated to the expedition, available on the website "Arrampicate.it". 7:40 a.m.– 12:20 p.m.– 3:40 p.m.– 8:00 p.m.
Radio station that supports and broadcasts Elfoavventure campaign for Africa and the latest and imminent expedition “2africa4love”. 6:57 a.m. - 9:57 a.m. - 12:57 p.m. - 4:35 p.m.